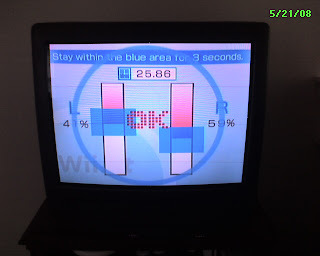 A photo of one of the balancing acts you have to perform on the Wii Fit for the Nintendo Wii. With my lack of balance it was a challenge. Another photo of the balancing act in motion. 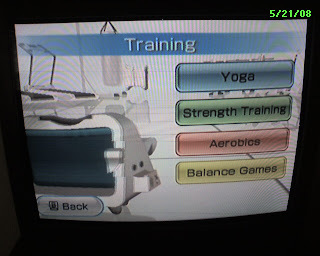 The main menu of the Wii Fit showing the different types of exercises. Work those flabby abs in this side twister. I suppose this would be step aerobics. There is a definite requirement for coordination here. For some unknown reason I didn't do so well. I think there is a learning curve on this one to learn what you need to do. First glance... 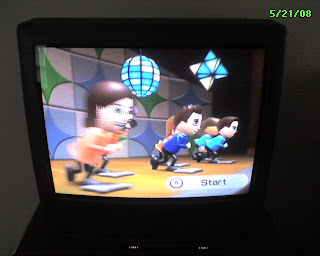 The Wii Fit can really put the workout to you. I would not have thought it would be so difficult. 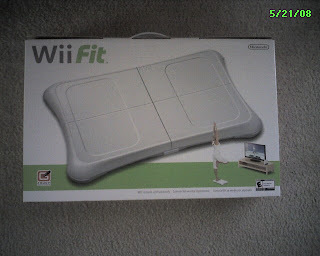 So today is the release date for the Wii Fit for the Nintendo Wii system. I got a hunch that the units might sell out quickly this morning. Originally I'd planned to go at lunch and try to get a system, however last night I changed my mind and decided to be there when Best Buy opened. I arrived at Best Buy at 10:00am est. I had even checked my clock against atomic time before leaving home. When I pulled into the parking lot it was 1/3 full and people were already in the store. I feared the worst as I went in search of the Wii Fit.In the store everyone I saw was carrying a Wii Fit. Near the Nintendo Wii section there was a crowd of 15+ people. I thought I'd missed it... A sales rep came by and I asked if I'd missed them and he told me there were some left on the next row. I dashed to where he pointed and scored a Wii Fit! 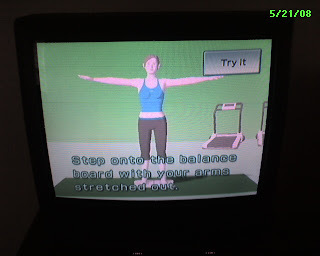 Fifteen minutes later and I would not have got a Nintendo Wii Fit. I've got some work to do so I won't get to play with it until lunch. More later from one of the cool people that scored a Wii Fit, me! 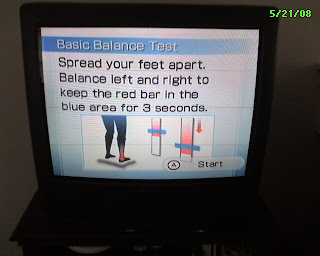 Remember there are those less fortunate that didn't get a Wii Fit.